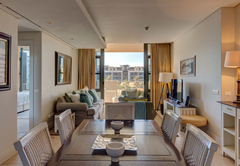 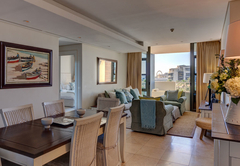 Kylemore 303 is a property providing self catering in V&A Waterfront for up to 4 guests visiting the Atlantic Seaboard region. 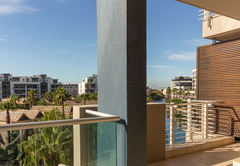 Kylemore 303, perched on the marine waterways of the Victoria & Alfred Waterfront, is elegant and chic, with muted tones that complement the pretty surrounds. 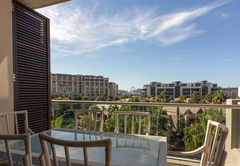 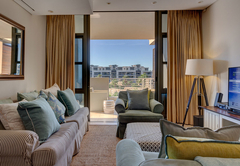 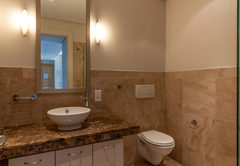 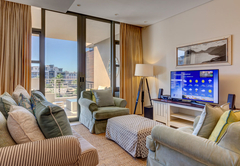 This apartment is conveniently situated just minutes from the Cape Town International Convention Centre, the shops of the Waterfront, and many other of Cape Town’s most popular attractions. 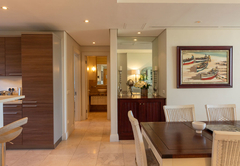 Kylemore 303 is a two-bedroom apartment (140 square metres) that sleeps four guests. 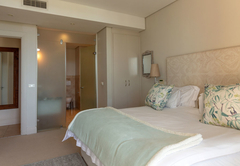 The main bedroom has a King-size bed and an en-suite bathroom with a shower and bath. 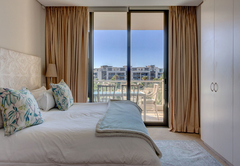 The second bedroom has two single beds (ideal for children, or push them together for another couple). 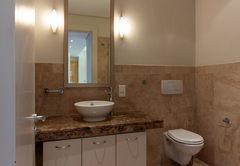 The second, separate bathroom has a shower. 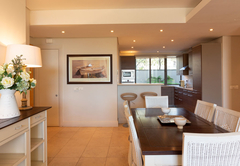 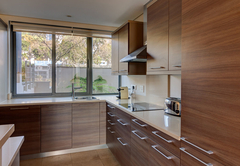 The open-plan kitchen, lounge and dining area are inviting and spacious. 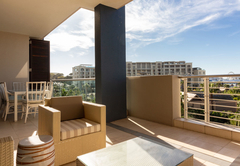 They lead out, via glass doors, to the balcony, where comfy seating is the perfect place to enjoy a morning coffee or an evening nightcap. 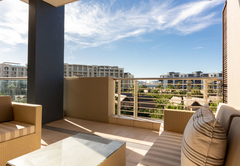 Views of the waterways from the balcony are simply gorgeous. 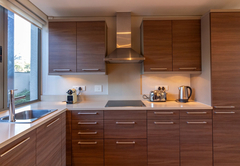 The kitchen is fully-equipped in terms of crockery, cutlery and appliances; and also has a dishwasher, washing machine, and tumble dryer. 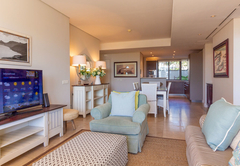 The entire apartment has underfloor heating, air-conditioning, a TV (cable), DStv, a DVD player, and free wireless internet. 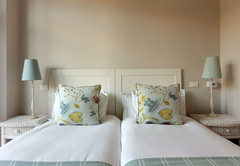 Linen and bath towels are provided, and housekeeping can be arranged from Monday to Friday. 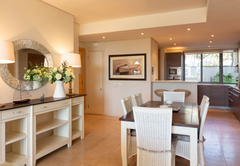 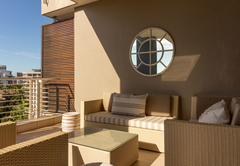 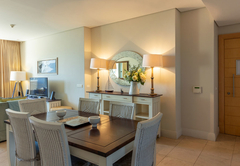 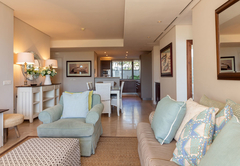 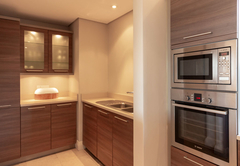 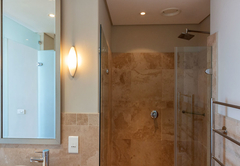 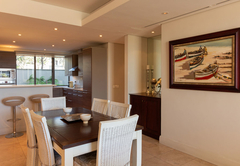 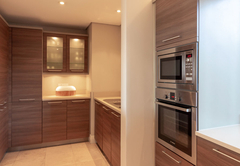 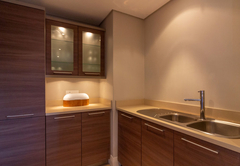 Kylemore 303 Holiday Apartment is situated along the marine waterways of the V&A Waterfront. 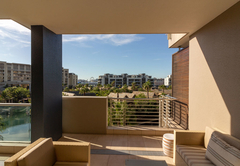 This means that it is close to the many shops and eateries, galleries, museums and other attractions of the Waterfront and City Bowl. 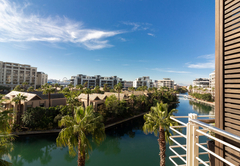 The Zeitz MOCAA Museum of Contemporary Art is a few minutes away, while the international airport is about 20 minutes from the Waterfront. 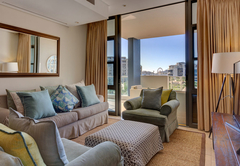 This is a two-bedroom apartment that sleeps four guests. 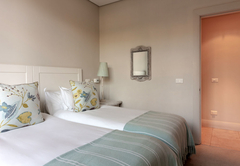 The main bedroom has a King-size bed and an en-suite bathroom with a shower and bath. 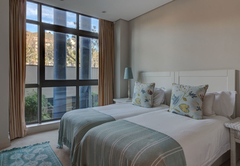 The second bedroom has two single beds and a separate bathroom with a shower. 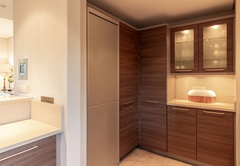 Response timeKylemore 303 typically responds to requests in 5-10 minutes.